James Venner was a bluff county squire; his wife kindly but fussy; his daughter withdrawn and secretive; and his only son, Tarquin, a musical prodigy of genius. Their lonely house in Devon seemed a sanctuary to young violinist, Vanessa Orchard, who went to live with them to coach Tarquin. But the family had a strange history…. Terror came to Vanessa in inexplicable ways – and Death was waiting in attendance at HOUSE MALIGN. Written by Julie Wellsley and published as a Mayflower-Dell paperback 1967. 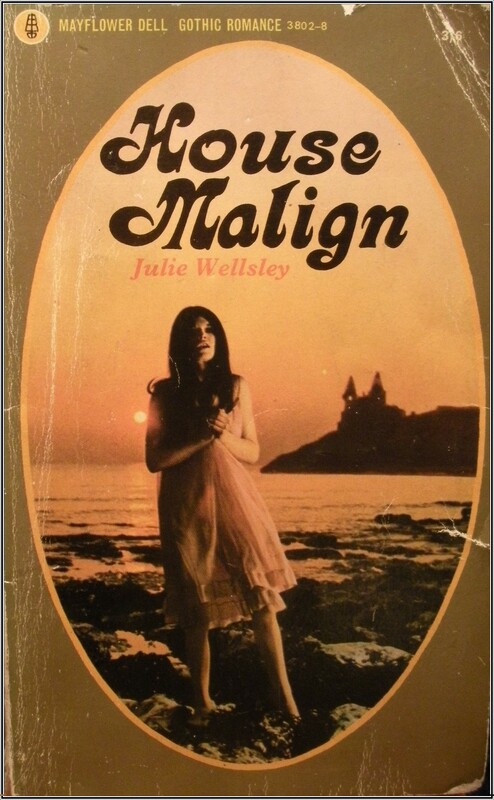 Having already read and reviewed Julie Wellsley’s Chateau of Secrets I was pretty excited when I stumbled upon this gothic romance tucked away in the Fifteenth Century Bookshop in Lewes recently – and what a bargain for 20p! Like Chateau of Secrets, this story centres around the grim and ghostly goings on when a young woman, in this case the violinist Vanessa, ends up living with a rather strange family in a rather isolated area. Vanessa needs to escape from the hustle and bustle of the city, in order to grieve over the death of her father and re-evaluate her life, so she jumps at the chance to work as a live-in music tutor with the Venner family in Devon. The suspense builds nicely as Vanessa finds herself increasingly cut off from her friends and embroiled within some rather strange goings on. There are hints at a terrible curse overshadowing the isolated old farmhouse and with the bad weather comes bad dreams and premonitions that someone or something is out to get her. Armed with nothing but her trusty violin and with no-one but the local vicar to confide in, Vanessa ends up fighting for her life and sanity as the story builds to its fiery climax. This is an atmospheric suspense novel with some nice gothic touches. We have violins, madness, strange midnight whisperings, foggy, deadly landscapes and a mangled kitten in the bed scene. The Venner family are very weird, especially the child prodigy with a penchant for Nazi memorabilia, Tarquin. There is very little romance getting in the way of the plot – in fact there is hardly any romance at all, which might put some people off. Though a more than eligible love interest presents himself early on in the guise of the handsome country squire Roderick Egan, Vanessa quickly writes him off as a bit of a bumpkin and he just as quickly fades to the back of the story line. Also I found the ending a little rushed and teetering precariously toward silliness but the writing is very effective and if evil boy geniuses are your thing then this is the book for you. Three out of five stars.